Susan's guests will enjoy a morning of creativity and friendship and will make-n-take two projects! If you cannot attend and would like to place an order for Susan, click Products on my website menu bar. Please be sure to add Susan's Code 74CBX9E6 before adding items to your order. We will create cards using sticker paper, embossing, and a mosaic tile technique. Fun and easy technique and a great way to use your left over Designer Series Paper! Class fee $8 or free with product order of $40. RSVP here by April 11. Cannot make the class? Place your online order and I will send you the instructions and the projects we made in class. My Team, the Create Happy Crew, meeting is scheduled for Sun, April 21, at Noon. We always have fun! April meeting is at Nancy's house. I will give everyone directions. Make swaps for the number of those attending. We will talk shop, discuss promotions, share new stuff and I will provide the project this month! If you would like to join My Team, contact me! RMHC ® Moving Forward Stamp Set Class. We can all make a difference and support the Ronald McDonald House Charities at the same time! We will make some adorable cards too! To RSVP to this class, purchase the Moving Forward set, #126320 (wood) $19.95 or #126322 (clear) $14.95, either online (hostess code TVUNFECZ) or through me by Mon, April 15. 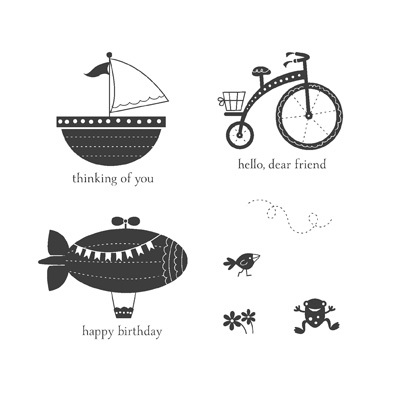 For every set purchased, Stampin’ Up! will donate $3 to Ronald McDonald House Charities. Whimsy and fun combine to make this seven-piece set the perfect choice for outside-the-box best wishes and greetings. Wonderful for friendship and birthday projects for young and old. If you cannot make the class date, purchase the set online (code above) and I will send you the cards we made in class! Either way, we will help Ronald McDonald House! Please tell your friends and family! Let’s sell as any Moving Forward Stamp Sets as possible! Why not purchase one for yourself and one for your Mom, sister, daughter or Aunt for Mother’s Day! Join us for one or all of these classes! We get creative and have a lot of fun!